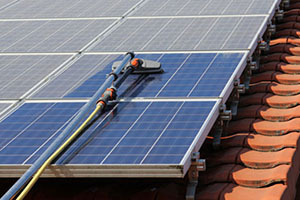 DMC Facilities Management provide commercial solar panel cleaning in Leighton Buzzard. Using our specialised poles and brushes, we can safely clean your solar panels without damaging the surface which will ensure maximum energy output. By using this tried and tested technique and equipment, our fully qualified DMC staff achieve outstanding results every time. Solar panels work by allowing light into the solar cells. The more light that hits a panel, the more power it will generate. Due to the angle of solar panels, they are more prone to bird droppings, a build-up of general dust and dirt that does not wash off with the rain. This reduces the amount of light hitting the panel and reduces its output. Regular solar panel cleaning will help protect and make the most of your return on investment (ROI). If you would like any advice regarding the cleaning of solar panels on your commercial building or if you are thinking of having panels installed and have questions regarding requirements for cleaning, please feel free to contact us. Trusted expert advice at affordable prices!